To view Skippers’ assets you have to turn her left arm backwards, and then reverse that to change her back to an A cup. There was also a doll called Growing Up Ginger released, who was designed as, err, another way of showing Mattel’s skill with rubber anatomy? Ginger was positioned as being slightly older than Skipper, so possibly a friend for Barbie, and a way for Mattel to show that they welcomed all hair colours, and as she was older, D cups? Oh dear. It’s quite unreal to actually view images of this doll, and not just because she’s actually 8 years older than me. I can’t imagine anything like this being allowed on the mass market today, as the PC brigade would never allow it. Then again, am I being slightly old fashioned in my surprise/shock? A large number of young kids regularly use computer games, all of which give you the chance to design your avatars, altering hair colour, skintone, and yes, size. Whilst they tend to focus more on body size in general, instead of bra measurements, breast size does change as you alter the figures, so surely the level of body awareness has just got more sophisticated, and Mattel was just ahead of the trend? Popular tween site Stardoll has a bust changing design built into its Avatar creation, and it’s not alone in this. If I think about things in this way, it makes Mattel’s ‘Growing Up’ range of dolls less shocking, as you could see them as forecasting the sadly inevitable trend into body conscious tweens and the rise of stories about padded bras for tweens, Miss Bimbo style games ( to progress in the game you have to get her a hot boyfriend, a cool place to live, and find a great job) and the overall sexualization of tweenhood. Mattel may have forecasted the demise of youthful innocence, but there’s no reason we should rejoice in this, and the infamous doll was taken off the market pretty sharpish and now sells for loads on eBay. What do you think about Growing Up Skipper- wish we had one now, or shocked it ever existed? The feminist in me wishes they’d brought out a ‘Growing Up Ken’ doll- now that would have been educational… and given a whole new dimension to those ‘Mummy and Daddy games’ that we played with our dolls. Find out more about Skipper on her Wikipedia page. I had growing up skipper as a young girl….a friend of the family bought it for me and my mother always hated it…..I used to walk around the house spinning my left arm…..if I only knew then…..today I am between a D and DD….must of spun that arm too many times….lol….seriously..I don’t think they would be allowed to make something like that now…. I had Growing Up Skipper as a kid and LOVED her! I sadly sold her at a garage sale and (thankfully) bought her again two decades later on Ebay. Since we live in the Dark Ages again, can you imagine the backlash if a toy like this was released today? The way I see it, a lot of parents are uncomfortable discussing growing up and maturing in a lot of ways. Young girls have some idea of what’s going on but some bits and pieces are still missing because either the parents don’t know the missing information or are just unwilling to share it. Perhaps if they made a more realistic rendition of it to release today it could help some tween girls. Some of the Dolls could grow a little bit, some a lot, then several in between to show them differences are normal. We forget to teach them that we’re not from a cookie cutter mold like dolls are. 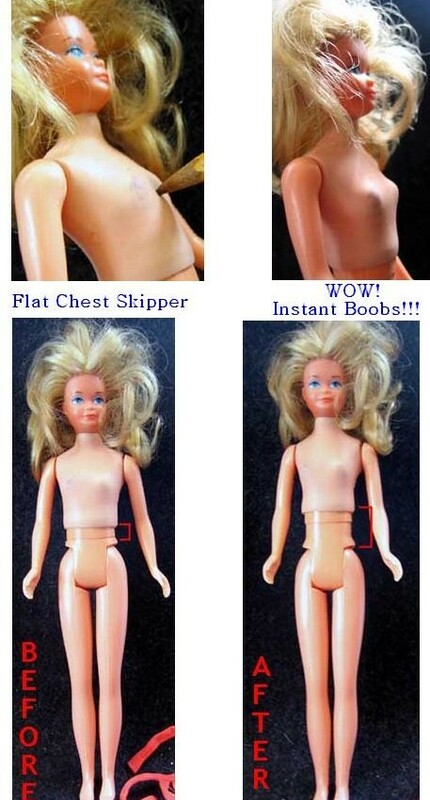 Reminds me of that “normal” barbie doll a guy made in shape to an average teen. Even if the “growing up” dolls could be a bad idea for today, perhaps the “normal” proportioned barbie could provide a more realistic expectation? That or just throw out barbie all together and bring in the stuffed animals to get rid of at least one unrealistic expectation of teenagedom. I have been collecting Barbie and family dolls for 30 years. I’ve never read before about Ginger being older than Skipper and a friend of Barbie instead. Ginger and Skipper are the same size doll. Ginger was sold only 1976 and is considered a rare Barbie family member. 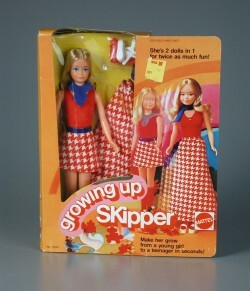 Growing Up Skipper had a lot of complaints when she was first sold in 1975 (I remember reading an article back then about her), but the doll was sold until 1978 with at least two box variations and two hair color variations. 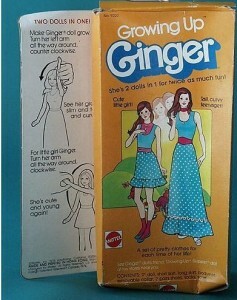 Thank you for adding the photo of the back of the Ginger doll box. It’s the first photo I’ve seen of it on the Internet.